As marine aquarists, we might think of algae as being divided into three (maybe four) distinct categories: the benthic (i.e. bottom-dwelling) microalgae, the open-water microalgae and the macroalgae. The first group consists of the film/turf-formers, the second group consists of the phytoplankton and the third group consists of the larger, plant-like seaweeds. The first group is generally regarded as “bad” algae whereas the second two are generally considered to be desirable. Oh, and that questionable fourth group? Maybe we could list an additional, relatively small number of “bad” seaweed species here, specifically those (for example, some Caulerpa) that can in rare situations become invasive in the aquarium. Of course, this broad classification is just a practical construct; there is hardly any phylogenetic basis for the arrangement. Tetraselmis (a green planktonic microalga), for example, is more closely related to Ulva (a green macroalga) than it is to Thalassiosira (a brown planktonic microalga). But, practical this classification certainly is. In just about every conceivable circumstance, film and turf algae really are bad! For one thing, they are rather ugly. They are also unnatural, as they do not grow to form particularly expansive films/turfs in healthy coral reef habitats. So they’re both ugly and unnatural… Pretty bad, right? For reef aquarists, that’s not even the worst of it. At their very worst, these forms can rapidly blanket entire sections of an aquascape, eventually covering and potentially killing sessile invertebrate life (e.g. corals). In aquarium systems where dissolved nutrient levels are chronically high, the negative influence of bad algae can be truly devastating. One big thing that phytoplankton and macroalgae have in common is that they can be effectively used to control film/turf algae. The reason that they both “work” for this purpose is that they compete aggressively with bad algae for nutrients. Once the nutrients are sequestered by the “phyto” and “macro,” they are eventually exported from the system respectively via water changes and harvesting. To some notable extent, nutrients will also be recycled as algal biomass is consumed by different aquarium animals. Starved out, the benthic microalgae are ultimately beaten down or even eliminated from the system altogether. Some aquarists wonder if using both phytoplankton and macroalgae in the same system is enjoying too much of a good thing. Not at all! Here, you could even say that multiple species of macro with multiple species of phyto wouldn’t be overkill. Indeed, because every species (desirable or otherwise) has its own preference with respect to nutrient availability, light intensity, etc., a combination of phytos and macros can be quite complementary in their fight against bad algae. But that’s not all; there are many other good reasons to use these beneficial algae. But, some of these uses are exclusive to one type or to the other. Let’s start with one major difference here. Sure, both types can be utilized as a food source by various aquarium inhabitants. However, each of these will only be consumed by certain sorts of animals. To the point, your corals are probably not going to graze on your Gracilaria. Nor will you ever catch your tang sifting phytoplankton from the water column. If you have both corals and herbivorous fishes (and you probably do), your tank will likely profit from the addition of phyto as well as macros. A typical reef tank will house all sorts of invertebrates, including corals, clams, sea cucumbers, sponges and so on. Many of these creatures are phytoplanktivores. For these, good health and coloration (if not survival) depends upon a proper density of phyto. 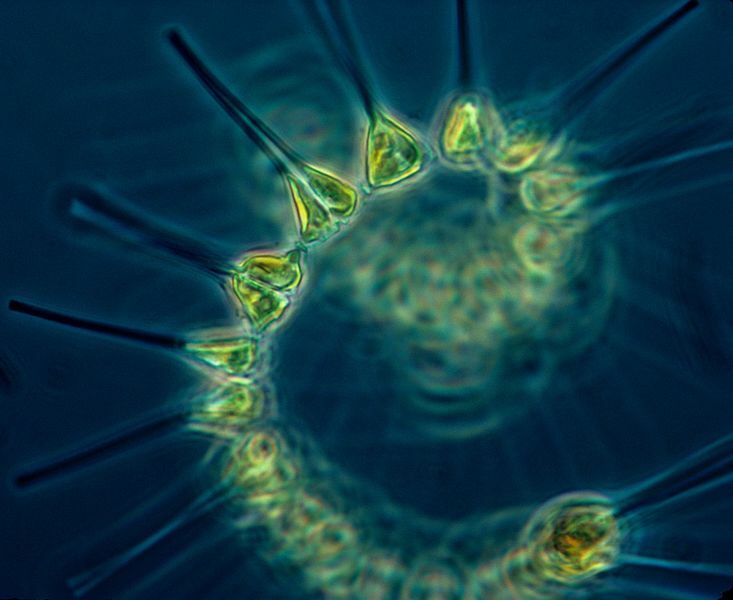 Each species might even prefer a phytoplankton of a specific size or nutritional profile. Therefore, a diverse collection of inverts will usually benefit most from a mixed-species feed. Yet, purchasing, storing and administering a whole fridgeful of different live phyto products would surely be a real pain. Luckily, AlgaeBarn has introduced a convenient multi-species product for all reef aquaria. As it contains a carefully formulated blend of four species—Nannochloropsis, Tetraselmis, Thalassiosira and Isochrysis—the ever popular live phyto product OceanMagik is ideal for general use. But we said a typical reef tank will be home to all sorts of inverts. This will almost certainly include herbivorous types such as many crabs, sea urchins etc. These critters, just like herbivorous fishes such as many tangs, angelfish, butterflyfish, blennies, boxfish, etc. will greatly appreciate the addition of fresh, live seaweed to their diet. Live macros usually provide considerably more vitamins, antioxidants, pigments etc. than “prepared” fare. They may be purchased on a regular basis for feed, though one can also use material harvested from a planted refugium. That brings us to yet another consideration. Sometimes, live phytoplankton and live macroalgae can be used together, for different purposes, to serve the same species of animal! Various types of macroalgae are commonly used in the refugium for nutrient export. While they’re there, they carry out another important task: creating prime habitat for copepods! Many copepod species that are available to aquarists are benthic as adults and planktonic as larvae. As adults, these forms of course thrive in a refugium packed with seaweed. But their young? You guessed it! They require a rich source of phytoplankton for proper growth and development. This culminates in a three-punch knockout for bad algae. The macros and phyto compete against them, plus they are consumed by the hungry pods! This also serves a three-course meal to your tank. You’ll have macro and phyto as a live food, plus the pods will constantly be available to zooplanktivores and small fishes such as mandarins. Does it seem as though your corals are lacking in vitality? Are you struggling with nuisance algae? It certainly might help to start adding live phytoplankton to the system. And if you add phyto, can you still add a little Chaetomorpha for your pods to live on? Absolutely. In fact, the presence of one of the major groups of good algae can actually increase the effectiveness of the other. Remember that each type fills its own ecological niche. Using macros and phyto in tandem can, in many cases, complete your ecosystem and create the healthiest possible environment for all of your animals! Anything to fight off bad algae I’m all for it.